Following World War II, Bismarck experienced significant growth and development. Its population nearly doubled from 1940 to 1960, reaching more than 27,000. Like most of the country, Bismarck was about to see major development and changes. One of the biggest changes ahead was that in the shopping trend for the region, shifting to national chain dominance. After sixty-one years in business, Webb Brothers Department Store closed for business in December 1945. The nation’s largest retailer at the time, Sears, Roebuck & Company moved into the Webb Building in September the following year after completing major renovation. Local retailers did continue to compete effectively, however, with the growing national chains. One local retailer, in particular, that continued to experience significant success was A.W. Lucas, even amidst major competition from national chains that included Sears, J.C. Penney, and Montgomery Wards. A.W. Lucas completed a major renovation and expansion project in 1949, adding nearly an acre of additional space. Bismarck Supervalu shortly after converting from Piggly Wiggly. Significant changes were also coming for grocery retailing the in the region, when Roy Rockstad & Eugene Leary purchased the local Piggly Wiggly in 1949, and converted it into Bismarck Supervalu – the precursor to Dan’s Supermarket. The local Piggly Wiggly had opened in Bismarck ten years earlier. 1948 saw significant improvements to Bismarck’s streets and transportation, including the installation of six new traffic signals and major widening of Main Avenue and 6th Street. With the growing city came major improvements to Bismarck’s education facilities. The Will School held its last classes in December 1951, replaced by the newly completed Will-Moore Elementary. A new Saint Mary’s Central High School building opened for classes in February 1952, followed by Cathedral Grade School later that year. Bismarck saw one of its worst floods in April 1952, when the Missouri River crested at 27.9 feet. 200 houses were destroyed and the Wachter Family reported the loss of 300 cattle. The Flood of 1952 was the worst seen in Bismarck in 42 years. Thanks to the closure of Garrison Dam the following year, widespread flooding wasn’t seen again until 2009, and again in 2011, neither of which as largescale as the flooding seen in 1952. Due to the frequent and widespread flooding prior to the completion of the dam, most of the land south of the railroad tracks, then predominately owned by the Wachter Family, had seen little to no development. Over the next few years, the river’s size shrank significantly, and for the first time, the city expanded south of the railroad tracks. Bismarck was the sight of a reported UFO Sighting the nights of August 5th & 6th, 1953. The object, described as being a “red glowing light making long sweeping movements”, was witnessed by at least forty-five local people and detected on radar by the Air Defense System. Several officers with the Air Force were direct witnesses to the red glowing object hovering over the region. 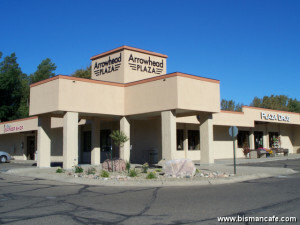 Bismarck’s first shopping center, Arrowhead Plaza, was opened in November 1953 by T. Clem Casey. Anchoring the new mall was the first officially branded Dan’s Supervalu, opened by Rockstad and Leary, who had converted the local Piggly Wiggly four years earlier into Bismarck Supervalu. Also in 1953, KFYR was one of three North Dakota stations to begin television broadcasts. KFYR became the NBC and ABC affiliate, and remained affiliated with both networks for decades. Harley McDowell opened Bismarck’s first drive-in restaurant, Big Boy, in 1954 on the corner of Main Avenue and 26th Street. Although officially classified as a drive-in at the time, Big Boy was actually a drive-through upon opening, just as it is today. The Provident Life Insurance Building opened in 1954. In October that same year, Provident Life Insurance completed construction of its new headquarters on the corner of Rosser Avenue and 5th Street. Provident Life was the largest privately-owned institution in North Dakota at the time. 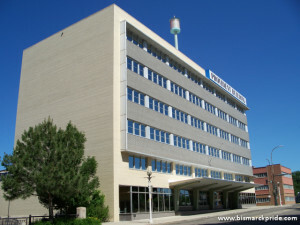 The Provident Building is well known as home of the weather beacon, which has been operated by KFYR almost continuously since the completion of the building. 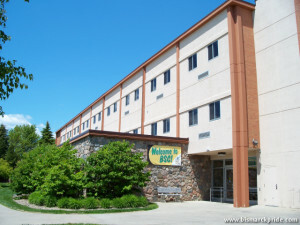 The facility housing both the high school and Bismarck Junior College was becoming too crowded to handle both institutions, so in 1955, the college moved into its own building on the grounds of the State Capitol. That same year also saw major changes at another college, when Mary College first began offering 2-year programs. In 1956, Bismarck’s old fashioned telephone system was converted to a modern dial system. That year also saw the first television broadcasts by KXMB, the local CBS affiliate. Schafer Hall at Bismarck State College was completed in 1961. The time that Bismarck Junior College spent in its brand new facility was short lived, when it was again forced to relocate in 1959 after the State Government took control of the facility to house its overflowing government offices. Local entrepreneur Harold Schafer, founder of the highly successful Gold Seal Company, donated a large tract of prominent land on Meadowlark Hill overlooking the Missouri River for the construction of a new college campus. Schafer Hall was the first building completed on the college’s current campus in 1961. The city’s second shopping center, and first fully enclosed center in North Dakota, Northbrook Mall, began construction in 1959. Its sole anchor was the city’s dominate grocer at the time, Red Owl, who occupied a large portion of the mall’s space until it closed in 1989. Even after Red Owl’s departure, Northbrook Mall remained vibrant throughout the 1990s. It was during that time that Northbrook Mall was home to nearly every necessity of life, with popular destinations such as AJ’s Music & Video (later Budget), Northbrook Drug, Kid’s Kuts, a post office, barber, and dentist. A trip to Northbrook wasn’t complete without a piece of Crazy Bread at Little Caesar’s. Northbrook Mall has since been known more as a business park than a shopping destination, unofficially rebranding as “Northbrook Professional Center”. The 1950s marked a changing retail trend for Bismarck, however most of its major shopping remained in downtown throughout the 1960s. As the city quickly expanded, however, it was inevitable that its major retailers would soon have to relocate. Like the rest of the country, Bismarck saw a major post-war population explosion that continued well into the 1960s. Not only was Bismarck growing due to the baby-boom, but also from people moving to the city from small rural towns and farms. Bismarck was no longer a small, isolated town, but a major city of the Midwest, and the perks that came with it.